The KMAC Youth Rock Climbing Camps are designed to make the connection and to bridge between indoor and outdoor climbing. Specifically, we aim to blend the best qualities of a traditional summer camp experience, the subtle observations and skills of a top-level indoor coach, and the risk management/technical skills of AMGA trained guides. Students will leave with a baseline of knowledge that will inform a lifetime of good decisions, not to mention they will have one of the best weeks of their lives. Students sleep in tents at KMAC’s private 10 acre secluded base camp outside Estes Park bordering Rocky Mountain National Park. Participants need only provide their own personal clothing items, a sleeping bag and pad. You’ll receive an equipment list upon registering. *Students should be in good physical shape and be able to carry a 30lb pack. Note: For full immersion in the climbing camps we have scheduled them to run consecutively to allow for a full 2 week camp. Students do not need to have taken beginner camps to enroll in the intermediate or advanced camps. All courses originate and end from KMAC’s headquarters on Deer Ridge in Estes Park. We provide pickup and drop-off at Denver International Airport for students arriving by plane for $30 each way. Participants traveling by car should arrive in Estes Park at 11:00am on the course starting date. Lunch will be provided at KMAC. Pick-up time is 11:00am on the course ending date. Participants traveling by air should schedule their arrival at Denver International Airport between 8:00am and 11:00am on the course starting date. A KMAC employee will meet your child at the airport. Departing flights should depart DIA between 8:00am and 11:00am on the course return date. Please contact KMAC before making flight reservations. (Ages: 12-17) Take your climbing skills to the next level and beyond. Be prepared for “all out” climbing on this 7 day course. We will sample all of the types of climbing: sport, bouldering, trad, even multi-pitch if the group is up for it. Hand cracks, finger cracks, roofs, slabs, off widths, chimneys, and more. This camp is designed to give the beginning and intermediate climber as much knowledge as possible about climbing and all that it entails. The camp offers students the opportunity to further develop and expand climbing skills in an extended climbing session. It is the perfect way to transition from indoor climbing to real rock. It is all about climbing and moving on rock every single day. Time is also given to working with protection, establishing belay stances and anchors and general rock climbing safety. You’ll learn the KMAC approach that identifies each aspect of a climbing situation. This involves planning, critical thinking, and analysis of each system before proceeding. Don’t forget that coming to this camp with a friend is a great way to become life-long climbing partners. We encourage this. Learning together is fun and helps a great deal as material is presented that students can talk about and share at a later date. Participants traveling by car should arrive at KMAC at 11:00AM on the course starting date. Pickup time is 11:00AM on the last day of the course. Additional airport pick up and drop off fees may apply. A sample itinerary is described below. The schedule can change due to weather, group skills, and other factors. Day 1: Students arrive at KMAC. Orientation. Equipment issue. Lunch and course overview. Next we head to the private KMAC crags to get a feel for everyone’s climbing abilities and interests. Day 2: The famous Jurassic Park. Tyrolean traverse and top rope sport climbing. Day 5: Bouldering: Chaos Canyon. Day 6: Multi-Pitch adventure: Pizbadille. Evening Celebration. Similar to the Beginner Camp, we will spend time in many different disciplines of rock climbing: sport, trad, bouldering, and multi-pitch. But this time we assume students have built some strength up back at their home climbing gyms or elsewhere. From this starting point we will have an intense week of climbing and learning. It is tailored to students who have demonstrated advanced abilities and skills. Every day we will choose multi pitch routes on big faces and crags in Rocky Mountain National Park and the surrounding valley. Early starts and long days are often the norm. Students will come away from this week with a huge boost to their climbing resumes and a solid understanding of how to evaluate the risks of a climbing situation as taught by professional climbing guides. Depending on what students are most psyched on, we will sport climb, boulder, trad climb, multi-pitch, slackline, and even get a chance to develop new routes/problems. Participants traveling by car should arrive at KMAC at 11:00AM on the course starting date. Pickup time is 11:00AM on the last day of the course. Additional airport pick up and drop off fees may apply. A sample itinerary is described below. The schedule can change due to weather, group skills, and other factors. Day 1: Students arrive at KMAC. Orientation. Equipment issue. Lunch and course overview. Intro climbs at KMAC’s private rock site. Day 2: Sport climbing at the famous Jurassic Park. Day 3: Lumpy Ridge, RMNP. Single and multi-pitch climbs. Crack climbing introduction. Day 4: Face climbing, multi-pitch routes. Day 5: Piz Badille multi-pitch adventure. Day 6: Bouldering/multi pitch/sport. Evening celebration. (Ages: 14 – 17) Bring your crash pads and take your climbing skills to the next level and beyond. This is a great camp to dive into bouldering and all that it entails. Perfect for beginners. Whether you are looking to send a V2 or V12, you’re sure to find this camp a learning experience. Note: It is not necessary to have taken the Beginner Climbing Camp to enroll in this course. Students with prior climbing experience will have the opportunity to further develop and expand their climbing skills in extended climbing and bouldering sessions by climbing with one of the KMAC coaching guides. KMAC guides are expert boulderers and are intimately familiar with Rocky Mountain National Park and other local bouldering areas. You’ll learn the KMAC approach that identifies each aspect of a climbing situation. This involves planning, critical thinking, and analysis of systems. Many students in our Bouldering Camps compete at national bouldering competitions though this isn’t a requirement. We recommend some level of experience with indoor or outdoor bouldering at least V2. Don’t forget that coming to this camp with a friend is a great way to become life-long climbing partners. We encourage this. Learning together is fun and helps a great deal as material is presented that students can talk about and share at a later date. Day 1: Students arrive at KMAC. Orientation. Equipment issue. Lunch and course overview. Venue options: Bouldering in Rocky Mountain National Park (RMNP), Suzuki boulders. Day 2: Lumpy ridge boulders. 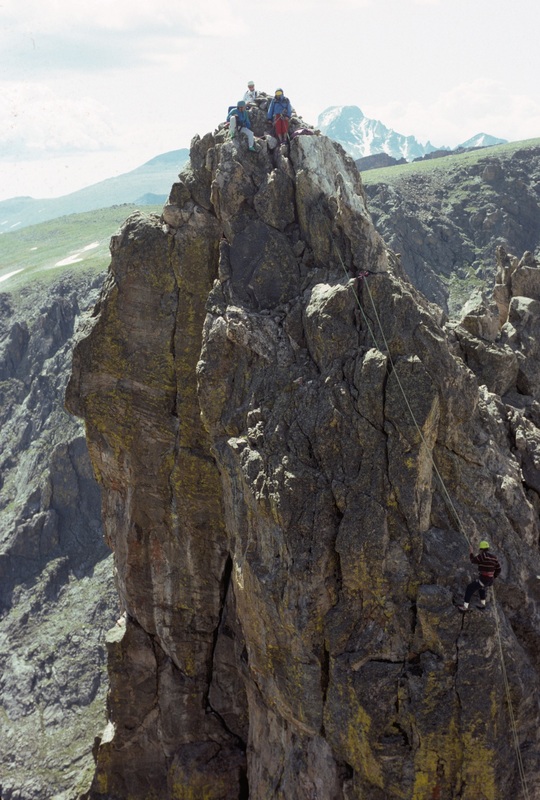 (Ages: high school age recommended) From the KMAC base camp in Estes Park, we’ll venture out into Rocky Mountain National Park daily to begin our skills training for mountaineering. We start with rock climbing basics then move on to snow climbing. Crampon and ice ax use will be taught and practiced in order to prepare for a number of peak ascent possibilities. We will learn to honestly and objectively assess our team strengths to pick an objective. Once we choose a peak, we will work backwards through all the steps we need to do to get to the top. In that process we will learn basic expedition planning and choose several training and acclimatizing goals to get us ready for our big send! Day 1: Arrive at Kent Mountain Adventure Center. Equipment issue. Equipment check. Rock climbing instruction in the afternoon. Camp at KMAC. Day 7: Alpine start! Time to put techniques to use. We will climb snow ice and rock to ascent one of the mighty peaks of Rocky Mountain National Park. Magnificent views in all directions. Return to base camp. Dinner. Evening discussion. Day 8: Break camp. Hike out to trail head. Drive back to KMAC base camp. Celebration feast and showers! (Ages: 14 – 17) This is an advanced course designed for students who think bouldering is life. Many are on comp teams and compete at national bouldering competitions, though this is not a requirement for participation. All we ask is that you can send V6 or harder in your home gym. Much of the course will take place in Chaos Canyon and other mega-classic bouldering areas of Rocky Mountain National Park. KMAC guide-coaches will lead nightly discussions and topics that will include: injury prevention, advanced training techniques, nutrition, and many other advanced skills. Each student will get to pick a “project” and return several times over the week to work out beta and go for the send! We will focus on pushing our climbing to the next level without injuries. This isn’t just a week of relaxing vacation, we will get up each day and focus on hard climbing and training. This course is directed by TJ Sanford, a nationally recognized coach who, for the past 10 years, has worked with teams all over the country to build programs which have led many of his students to podium at Nationals. He will bring his vast experience each day as we dive, head first into some of the sickest boulders in America. (Ages: 14-17 ) The Elite Climbing Camp is designed for advanced climbers wanting to take their climbing to the next level. We recommend you can climb at least 5.12 in your local gym to attend. This course is staffed not only by AMGA trained guides but also by elite level coaches and trainers. 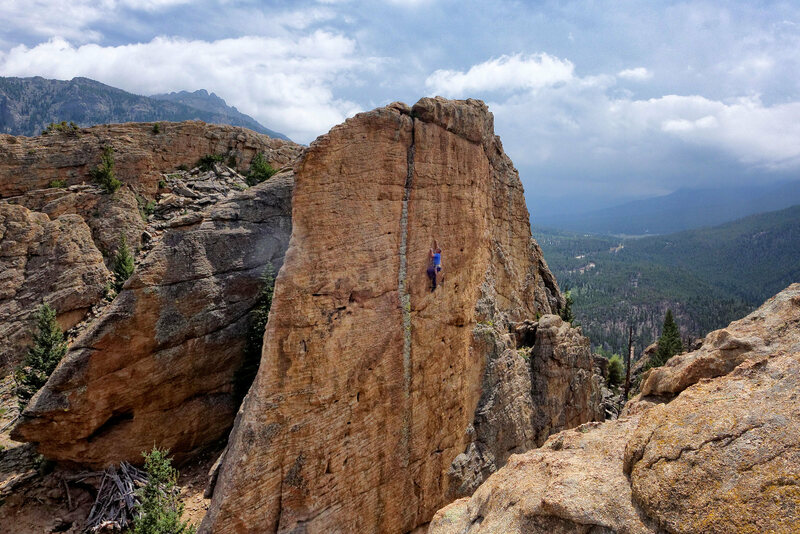 We will spend our days sport climbing and bouldering at the premier venues of Estes Park and Rocky Mountain National Park seeking your dream route. We will discuss, then practice, high level route selection and redpoint techniques. Students will leave with a solid understanding of how to train for, redpoint, and send the hardest climbs in the world (one day)! Time will be divided equally between sport and bouldering with a focus on getting stronger. Our goal will be not just to go out and climb each day, but to receive the full structure of a personal climbing coach at the crag. Through a range of high and low tech tools, we will work with you to analyze your performance each day; identify strengths and weaknesses then address those weaknesses with targeted exercises. We will learn advanced tips, tricks, and strategies for redpointing routes and problems. Throughout the week we will have guest speakers from the professional climbing world drop in and talk about their adventures and recommendations on how to climb harder! This course is directed by TJ Sanford, a nationally recognized coach who, for the past 10 years, has worked with teams all over the country to build programs which have led many of his students to podium at Nationals. He is well suited to cross the bridge between traditional rock guiding and high level competitive team coaching.